Earlier in this blog post series, we talked about how each social network is just a little bit different and our approach to each one should be carefully crafted. At the time, I cautioned against simply using social media integration tools to broadcast the same thing across your social networks. I stand by that advice wholeheartedly, but there are still plenty of useful tools you can use to streamline your social networking process. Hootsuite creates an easy-access dashboard for Facebook, Twitter, LinkedIn, Google+ and more. By connecting your accounts, you can view all your social networking streams in one places, instead of logging into each site individually. It also allows you to schedule posts to publish at specific times that you choose. Hootsuite provides some analytics, but many of the features are available with a Pro account and can get quite expensive. Depending on how much you use Hootsuite, this may or may not be worth it. A Pro account is also useful if you have more than 5 profiles to manage and/or you have a number of members on your social networking team. Other similar tools in the marketplace include SproutSocial.com and Tweetdeck.com. TwentyFeet provides you with a dashboard of social networking analytics for Facebook, Twitter, YouTube and more. It also can bring in your analytics for bit.ly, if you happen to use that as a link shortening service. They actually call it an “egotracking service,” but it’s more meaningful than something like Klout, which reduces social networking into a popularity contest. The site allows you to compare the analytics from various sites to see where you might increase or adjust your efforts. The service also notifies you whenever something noteworthy happens in your accounts. A basic account with one Facebook account (not Page) and one Twitter account are free. There are monthly fees if you want to add anything from there, but the cost of analytics is more affordable than provided with Hootsuite.com. There’s something to be said about finding the optimal time to participate in social networking. After all, you want to ensure you reach the biggest percentage of your targeted audience as possible, right? While, there are plenty of studies out there to help you find the optimal time, it always depends on your own unique audience, so you have to analyze things yourself. A couple of tools that might help you include TweetWhen and Tweriod. TweetWhen analyzes your audience for you and gives you an optimal time to tweet, based on when you are most likely to get the best response. Because you don’t have to log into your account to use this service, you can also use it to gain intelligence on the best times for other Twitter users like your competition and other likeminded tweeters. However, it’s important to realize that TweetWhen’s data is based on when you’re actually tweeting, so if you tweet more at certain dates and times, these are more likely to be favored in the results. 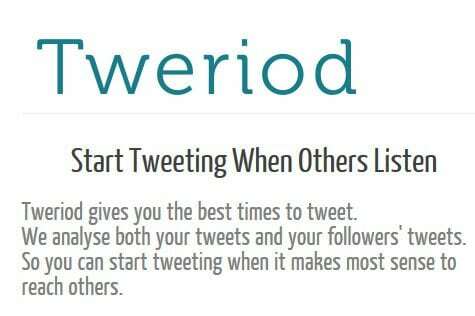 Tweriod is a service that looks at the activity of your followers to determine your best time to tweet. The logic is, you should be more active when they’re active. Taking the data from TweetWhen and Tweroid together can help you figure out ways to adjust your participation in Twitter for best results. Technology is out there to help us and you can certainly use it to your advantage to make it easier and more efficient to participate in social media…without looking like some kind of bot that is just auto-broadcasting everything. Find the right tools for you and it will be much easier for you to manage your social media participation.